In my most recent series of paintings I have discovered a new sense of freedom. By applying the paint intuitively, I create a raw rhythm of line, color and shape. The process has now taken precedence over my traditional subject matter. I adhere to this process through daily ritual, constant digestion and the utmost respect for my craft. I believe that creating art is a mystical endeavor and not to be taken lightly. Jonathan Eckel was born in Glenside, Pennsylvania in 1980. He received a BFA from Tyler School of Art in 2003 during which time he spent one year studying abroad in Rome, Italy. Before, during and after his fine arts studies he traveled extensively in North and Central America, Eastern and Western Europe, Asia and Africa; spending one full year living in the Great Rift Valley. 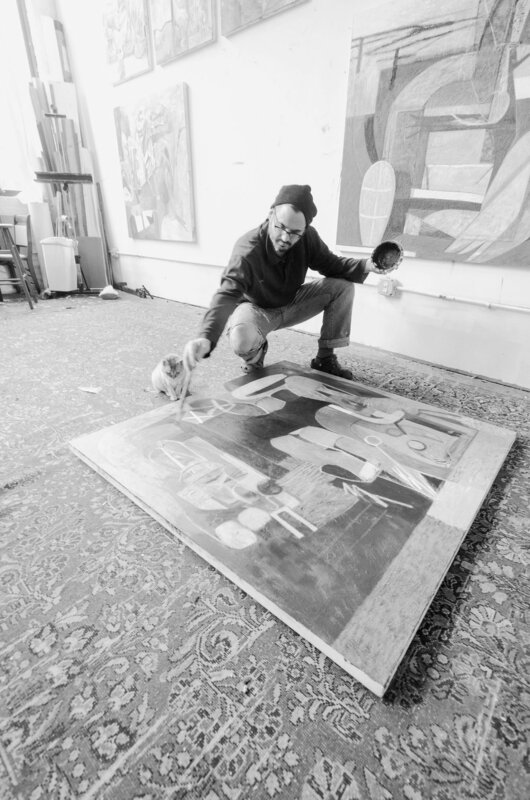 In 2010, he spent three months as an artist in residence at the Vermont Studio Center which greatly impacted his creative practice and painting style. Most recently, he spent three months as an artist in residence at the Ballinglen Arts Foundation located on the sea coast of North County Mayo in the Republic of Ireland. Eckel is primarily focused on painting and drawing, exploring new subject matter and styles, often blurring the line between abstraction and representation. This constantly inviting and developing approach to art-making allows for experimentation, reconsideration and action; giving the artist the freedom needed to make an honest mark. The diversity of his imagery is strongly influenced by his world travels along with his deep interests in the history of art, anthropology, philosophy and music. Eckel’s work is included in many public and private collections including the permanent collection of the Woodmere Art Museum. The artist currently lives and works at Greene Street Artists Cooperative located in the historic section of Germantown, Philadelphia.